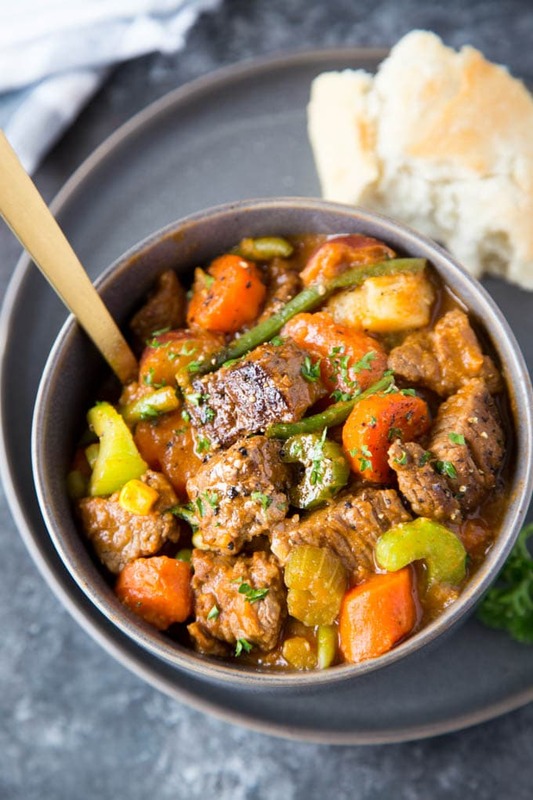 Crockpot Beef Stew- A comforting slow-cooked healthy dish filled with tender pieces of beef and loaded with vegetables and a hearty broth. Let the slow-cooker do the work…only a few minutes of prep-time. I couldn’t have picked a better day to make this Crockpot Beef Stew! The weather had turned blustery and Seattle was blanketed by its first (albeit very light) snow storm. The wonderful aroma of the beef stew wafting though my house, the cozy fire in the fireplace and the snow falling outside the windows…these are exactly the kind of days Crockpot Beef Stew is meant for! Days when you want healthy, wholesome, easy to prepare comfort food. 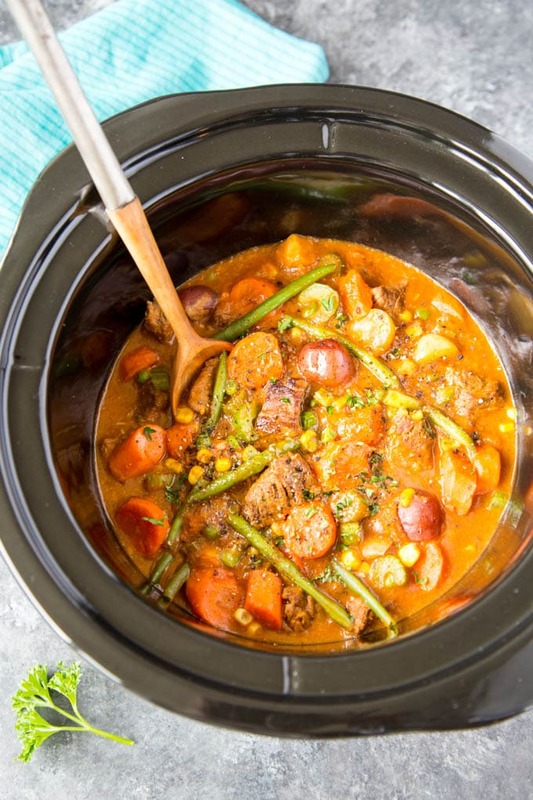 The beauty of this Crockpot Beef Stew is that you can completely customize what vegetables you add to the stew based on what you have on hand ( or what the kids will eat). You can use fresh or frozen veggies or a combo. I’m using a mix of fresh vegetables ( carrots, onions, potatoes and celery) and some frozen ( peas, corn and green beans). The flavorful hearty broth will work with whatever vegetables you choose to use. If you want to keep prep time to a minimum consider using pre-cut produce from your grocers or frozen mixed vegetables. Or, prep the vegetables a head of time and put them in a zip-top freezer bag in the freezer ( freezing will help to keep the potatoes from oxidizing and turning brown) until you are ready to use them. You can also look for pre-cut stew meat at the grocery store or cut up the meat ahead of time and store in the refrigerator. Comfort food….sometimes you just have to have it! Might as well make it healthy and easy too! 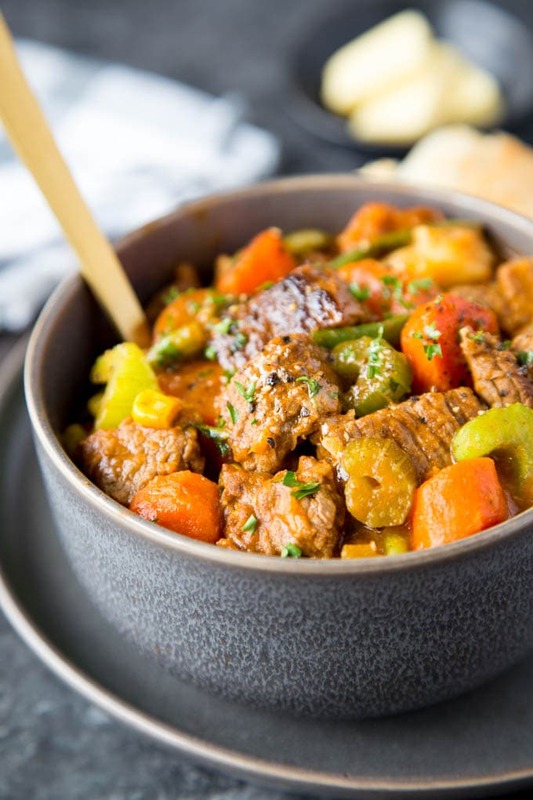 Crockpot Beef Stew- A comforting slow-cooked healthy dish filled with tender pieces of beef and loaded with vegetables and a hearty broth. Let the slow-cooker do the work...only a few minutes of prep-time. Heat olive oil in a large skillet over medium-high heat. Add beef to skillet (working in batches if necessary) and sear on both sides (2-3 minutes each side). Meat will not be cooked through. Transfer beef to the slow cooker ( 5 or 6 qt. ). Add the following to the slow cooker; beef broth, onion, carrots, celery, garlic, tomato paste, Worcestershire sauce, paprika, oregano, cumin, potatoes, salt and pepper. Cover and cook on low for 6-8 hours on low or 4-6 hours on high until beef and vegetables are tender. About 30 minutes prior to serving, whisk the flour with ¼ cup water in a small bowl. Stir mixture into slow cooker and mix with stew (this will help to thicken up the stew). Add frozen peas and corn. continue cooking for 30 minutes. Serve and garnish with parsley if desired. Sounds delicious! I often use Worcestershire and paprika when cooking, and they add a nice kick to the overall flavor of a dish. This will be great comfort food when winter finally arrives here. Your snowy day/fireplace/beef stew scenario sounds wonderful to me, too!